Back in August iRiver released their first touchscreen ebook reader exclusively in Korea called the iRiver Cover Story. Fast-forward a couple of months and now the iRiver touchscreen ereader is selling from Waterstones in the UK for a competitive £149, about £50 less than the new Sony Touch. The description page over at Waterstones lacks any substantial information about the device, but the iRiver website has the low-down on the new iRiver Touchscreen eReader. Apparently, the one selling from Waterstones looks to be the non-WiFi model. So here are the details . . . I Like that it has Voice recorder, I use it all the time to record classes and advisor orientations. It ís a nice touch. Very nice clear description and sharp video. Thanks. 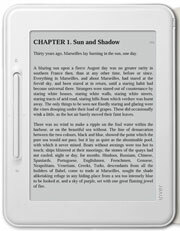 Does the wifi version have a browser able to connect with a library to download loanable books? It has an ebook store. No ereader can download free library ebooks via the browser as far as I know; you have to use Adobe Digital Editions to transfer the ebooks to the reader. Does it have the touch layer like the PRS-600 or does it do away with like the PRS-650. If the latter then it is definitely a good deal. I don’t know what type of touchscreen technology iRiver is using, but it doesn’t appear to have any excess glare in the video. Maybe someone from the UK will chime in to let us know. Looks like it is about par with the PRS-600 :-(. See here for a UK review. Nathan, do you know if the WIFI MODEL of the iRiver Cover Story has a web browser, even basic ? I Know that it can surf directly to the eBook store that comes with it. But can it browse other sites ? Sorry, but I don’t know. We haven’t gotten those over here in the US yet so I have never tested them.